Make sure your contrasts are high enough. Caring about contrast means caring if your readers will be able to read your chart on their screen, even in low light and even if you use light colors like grey. This is especially important for text: The smaller the text, the higher its contrast to the background needs to be for it to be readable. The contrast ratio between background and foreground should be at least 2.5 for big text and at least 4 for small text. In addition to having a high contrast ratio, avoid complementary hues (e.g. red and green, orange and blue) and bright colors for backgrounds. Use this tool to test your color contrast, the brightness difference and if colors are “compliant”. Don’t use a gradient color palette for categories and the other way round. It might be tempting to use shades of one hue (e.g. blue) even for categories, to make your chart look less colorful. However, since many readers will associate dark colors with “more/high” and bright colors with “less/low”, such a color palette will imply a ranking of your categories. Use different hues (green, yellow, pink, etc.) for your categories to avoid that, and to be able to talk about these colors. Readers might be quicker at finding specific categories if you make their colors stand out with a different lightness or saturation, but note that your chart should explain why these colors stand out. If you find your chart too colorful, consider another chart type for your data. The Power of The Palette: Why Color is Key in Data Visualization and How to Use It by Alan Wilson. Concise but still comprehensive introduction to sequential, diverging and categorial color palettes, with neat illustrations. Subtleties of Color by Robert Simmon. Exhaustive introduction to color theory in six parts. Viz Palette for Data Visualization Color by Elijah Meeks. 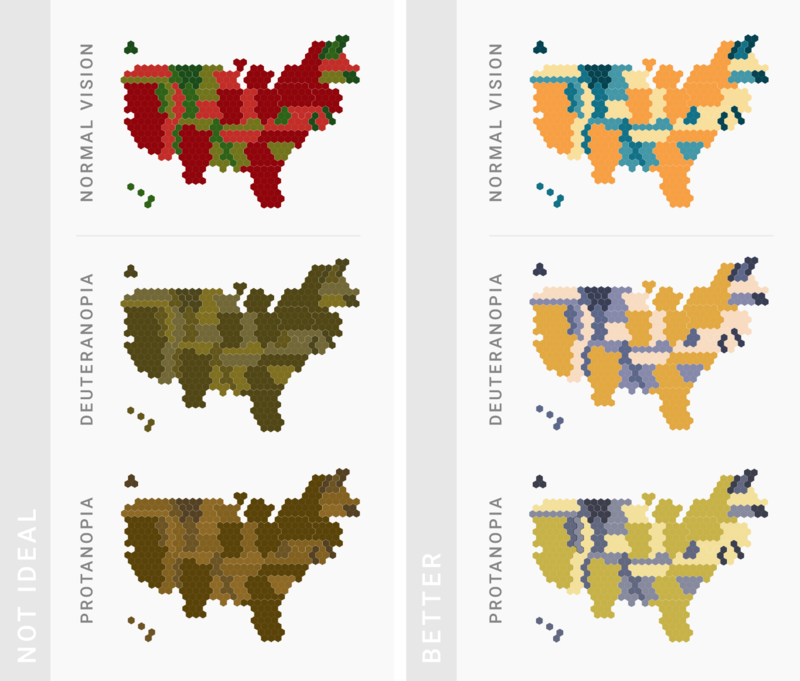 Rules for color usage in data visualization that Elijah learned while he and Susie Lu created the tool Viz Palette, especially in the second part of the article. Make grey your best friend by Andy Kirk. Explains all the ways grey is important for data vis. How The Rainbow Color Map Misleads by Robert Kosara. Explains the shortcomings of the popular rainbow color scales. Data Stories: Color with Karen Schloss. Very recent podcast episode about general rules for color usage in data vis, and Karen’s research on the topic in particular.